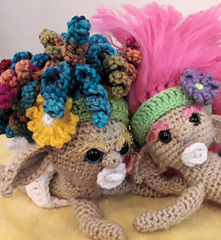 The Baby Fairy Surprise Crochet Pattern is an Advanced Beginner Level amigurumi pattern. 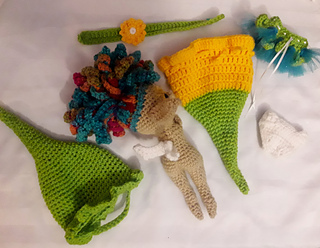 It makes an adorable cherubic baby fairy, and comes with a flower pouch and the patterns for its cute little accessories, including diaper, tutu dress and headband. The hair can be hidden inside the hat! 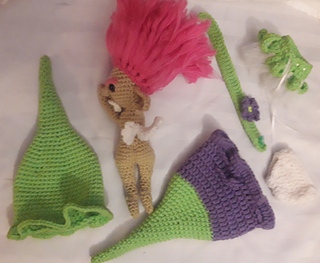 The idea sprouted from the popular LOL dolls that my girls enjoy. They love surprises and not knowing what they will get. 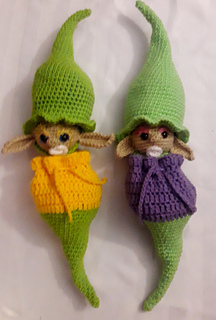 The baby fairy surprise doll pattern gives you so much creative freedom and choice to make each doll a special surprise! 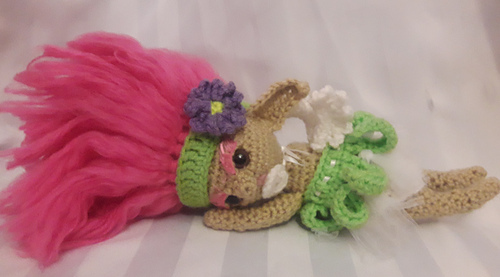 The doll itself is approx.10 inches from the top of head to toes (not including hair), but when she is all packaged up in her pouch and hat, from tip to tip she is about 21” long. 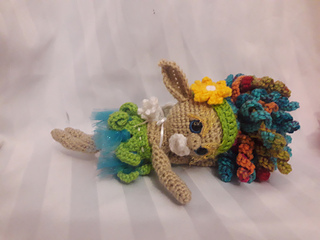 This pattern uses US standard crochet terms. There are pictures included to assist you. Green, White, Hair color, Skin Color, Flower color. Super glue (such as e6000) to glue on the eyebrows. It uses basic stitches and methods, such as SC, HDC, Sl St, Ch, Increasing and Decreasing, and working in the round. It also uses back loops and front loops and requires some hand sewing.